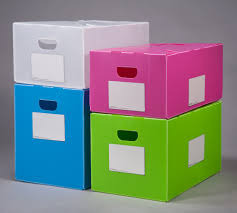 We have uniquely positioned ourselves as a dependable firm, engaged in manufacturing and supplying a commendable array of ReusablePlastic Boxes.These boxes are precisely manufactured using excellent quality polypropylene (PP) and latest technology by our skilled professionals. In order to ensure quality and flawlessness, these boxes are stringently tested against various parameters by our experts. Apart from this, remarkable quality and fine finish increase the demand of our offered range in the market. These Reusable Plastic Boxes are robustly designed to protect the fragile products such as glass items, screens, mirror, plastic empty jars, all sought of light weight material etc. Assiduously designed, these boxes are easy to carry and light in weight. Our matchless boxes are completely hygienic and can be recycled for reuse. Easily cleaned, multiple color choices, environmental friendly, smooth surface, light weight, easily fold-able, moisture resistant, long lasting nature, are the special quality attributes of our Corrugated Boxes & PP Corrugated Boxes. In addition, these are available in standard as well as customized sizes as per the requirements of our valued customers. Established in the year 1992, at Panchkula (Haryana, India), we “Amit Engineers” are reputed manufacturer and supplier of a comprehensive array of PP Corrugated Boxes, Crates & Bins, SS & MS Pallets. These products are precisely designed and manufactured using the best grade raw material and innovative technology in accordance with the set industry standards. Our offered products are widely acknowledged due to their attributes such as high load bearing capacity, precise dimension, sturdy design and flawless finish. Apart from this, our offered products are available in various specifications and can be customized as per the diverse requirements of our esteemed client’s at the most reasonable prices.